Using a common abbreviation relevant to Christianity, a nonprofit identity is defined as classical and traditional; yet open to change and dynamic cohesion among many faiths. In this case, 'X' transforms from an abbreviation to metaphoric of the variable found in equations. My religious and spiritual background varies and… leads to interesting places. Especially, growing up. That’s all I’ll say because as these things go, the rest gets highly personal. Not the founding reason or how I came up with the name for this brand identity case study, though. This reglious and/or nonprofit identity study attempts to capture a lifestyle as much as a religion. The name comes from the common abbreviation of ‘Christ’ to ‘X’ in various instances of western culture. 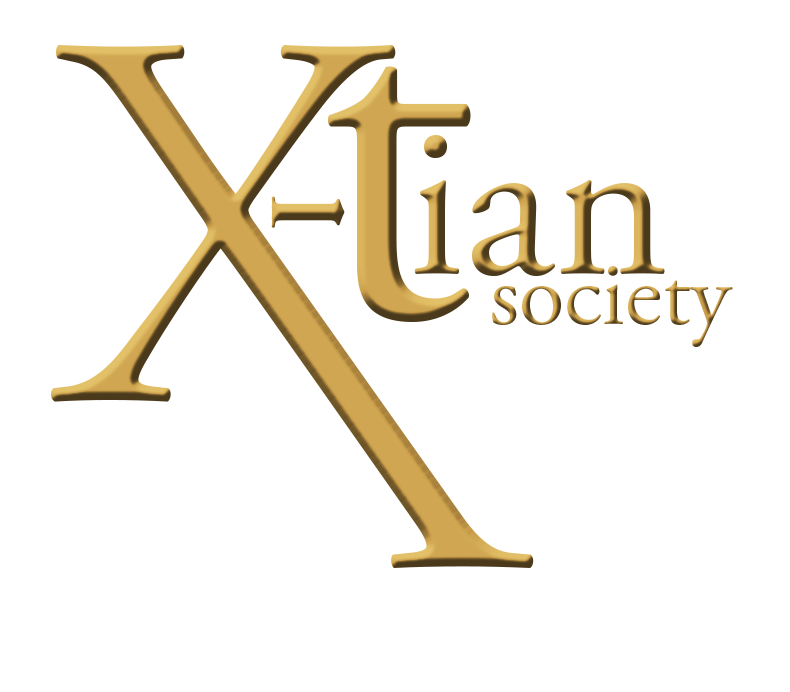 It’s not a new thing at all, but I decided on ‘The Xtian Society’ or ‘Xtian’ after watching a Futurama episode where they explain how in the future ‘Christmas’ is now called ‘Xmas’. To be clear, the idea behind this organization isn’t solely Christian, rather it falls in the latin understanding of the world catholic, which means universal. When developing content, I purposely took from the Bible as well as buddhist and Hindi sayings— more on that later. 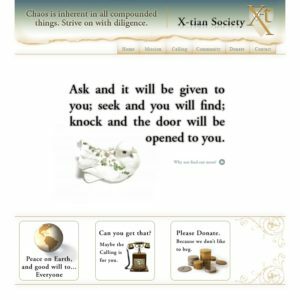 ‘X’ operating in the identity as a variable akin to math and logic would have been a natural outcome of a first meeting I refer to as the discovery dialog. As anything begins, the mind wanders and I doodle. I found I was concentrating too too much on modernizing (more as in adding in elements of the modernism movement than bringing something up to date). The logo became too sterile in my view, but it does contain something the final treatment doesn’t involve. There are 3 crosses present, rather indicative of the trinity. The ‘x’ is one tilted at an angle and created by extending the one leg of the ‘x’, the ’t’ another but with an almost dagger point (Judas, anyone? ); and the last created the negative space created by the proximity of the lower case ‘I’ and ‘a’ as ell as matching spacing. To be clear, it’s the white space. I forgo the ’subject/background’ definition of positive/negative space and always refer to positive space a something literally taking up space and negative space is the unoccupied area around said positive space. This version proves perhaps even fascist in its sensibilities. Religions are undeniably highly allegorical in their stories and histories, and that was a necessary consideration of this idea. Having largely experienced Christianity and catholicism, I went on to imply those references to this identity above others. I may revisit this project in the future to broaden that referential scope, but for now It’s stable. However, there is implanted in the identity a bit of bait and switch as Xtianity is much more about openness and reverence than believing in one type of god or another. As stated, the old combination mark was overly sterile and strong. It lacked an elegance, grace, and solemnity so often found in representations of religions. Once I found an appealing serif font, it became a matter of adequately recreating the tilted cross idea. After some efforts to fiddle with spacing, though, it became apparent 3 crosses weren’t going to happen. The new tittle cross is more effective due to the line wait of the new font and its serifs. 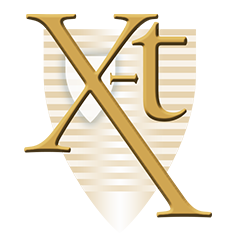 The shield in the ‘x-t’ abbreviation came about because it represents defense and protection. Additionally, I’ve always like the British title ‘Defender of the Fatih.’ It just sounds cool. Also incorporated in the shield are 13 bands to represent the 13 tribes of Israel. This is also important from the 12 apostles of Jesus, too, if you include Jesus in the that count— or Mary Magdalene. Like I said, a focus on this identity is inclusion. The shield only appears in the ‘x-t’ or abbreviated logo to provide more visual interest in the confined space. 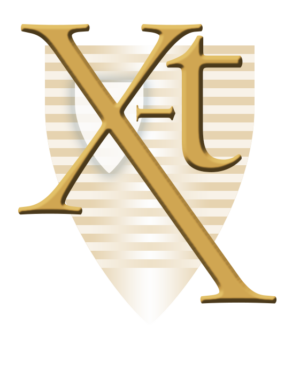 Additionally, the smaller shield helps emphasize the cross in the ‘x’ for clarity and meaning. A primary rule in any logo design is it has to work in black and white. This is basically for clarity, but there are more reasons. Once a logo is refined I black and white, that’s when I tackle color and other decorative concerns. To keep with the solemnity and grace, colors were chosen from a warm and light perspective. Gold becomes the reverence reference of value and rarity. Lighter blues, though warm, serve to make the gold more approachable. Softness is any media martial would further be augmented by incorporating a gradient from the darkest blue through the gold to white. This would not be present for black and white prints. 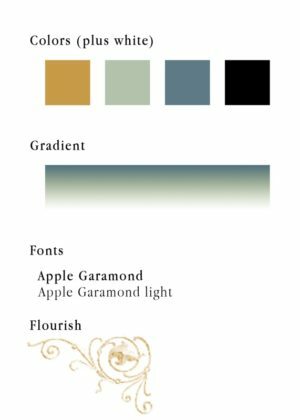 The Font is an altered form of Apple Garamond, and spacing of any kind for all elements are defined in a separate text document. Lastly, the flourish existed as an extra piece, but didn’t make it into the final version of the website’s design. It along with a gold ‘tear’ (not pictured) serves to round out a presence relating to archaic elegance and sophistication. As with a few other domains, I held onto this one for awhile before I finished the identity. I view it as a necessary preliminary step. Once named, I track down and obtain it, or an extremely sensible and close approximation. This comes from experience in identity development where scope studies report the viability of attainable domain names versus exact names in the domain if not available. I recall creating reports based on anti-brand domains such as ‘ihate(brandname).com to see how much damage that type of thing can do. Anyway, the original .psd, designed in 2006 or 2007, was a basic multi-page site, and that’s actually how the ‘golden tear’ came about. At the time, and now because it is baby of mine, I still think of this old-school design fondly. Old school, and still elegant. The final site is modern and responsive. One page websites seem to be a tend that’s here to stay. They certainly help me develop smaller chunks of content for studies such as this. When I finally got to implement this website after completing the combination mark, one particular template stuck out in memory. The new design and site came to life. The original template called for a background image to fill the page, but to make the brand coloration persistent–and the site load a bit faster–I recreated the style guide’s gradient in CSS form. I planted the ‘golden tear’ at the bottom, and filled the site with content. What really drew my attention to this template was the cross fade between content sections. More and more in teaching web design, and in my implementation of free lance work and studies like this, I think about storytelling and storyboarding the narrative the user encounters. It helps develop a cohesion between content section no matter how the user is passing between them. I tend to be prophetic with dramatic flair. I knew going into this identity study I couldn’t get carried away in literally creating my own religious following. The general premise of this nonprofit is openness and reverence for all living things. It comes form personally philosophies that basically mate an unholy union of various beliefs (see what I did there) I’ve experienced. Mostly a respectful combination of Buddhism and Catholicism, though. Quotes from both serve as headlines and introductions while the detailed content serves as explanations and reflections of them at the same time. 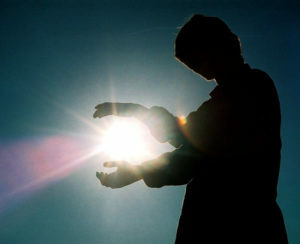 You’ve got the touch… You’ve got the power. An informational site from the beginning, I wrote passionate and relevant phrasing, but also expositional. This is where the danger of actually creating a real following came in. 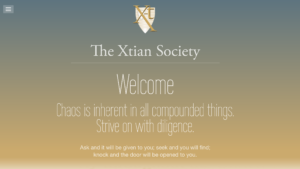 Between the mission and calling sections, I created a very base version of the Xtian philosophies and established basic ranks or positions in the Society. In all of these studies, I track down the most useful free stock photos (which also must reflective of content) and pull them into an image editor to tweak further. Lastly, and though I didn’t mention this before it plays a huge part, classicism and tradition take great significance in the visuals. The following itself doesn’t necessarily have traditional values. Such visual cues give an image or idea a calm, stable, and ‘well practiced over time’ street cred. To further enhance this on the website, as seen in both new to old versions, images of older and/or warmer color channeled objects accompany and help summarize each page visually in the headline. Old items suggest tradition and nostalgia. I recall, early in my design career and a piece not worth displaying, I designed the front end of an import/export documentation website. Included in the homepage design was an old sextant and a circa 1930s dual prop cargo plane. Received by all members of the teams involved with enthusiasm, and implemented because they reinforced ideas I’ve mentioned above. Their presence also indicated a cohesive understanding we all had (especially me, who created the design) of the identity of the company as stated by the owners and president. However, the president did step in because he happened to pass by my office and told me to change out the plane based solely on the statement, “We’re modern!” That was my first lesson in adequately pitching a design and having to defend it according to expertise. The conversation made no waves, but the president attempted to pull the “but it’s my money” card in the end. Thankfully, support by the design and development teams, as well as the owners, won in the end.